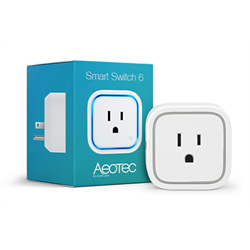 The Aeotec Smart Switch 6 makes your outlets smarter by giving you the ability to control the on/off function of small appliances or lamps that are plugged into it. The ZW110 Smart Switch 6 can be controlled from your favourite home automation hub, Zwave enabled security system, Zwave remote or other Zwave controllers. Use your tablet or a smartphone app for convenient control anywhere. Smart Switch has a built-in surge protector and overcurrent protection to help keep your electronics safe. Don’t want children on video games or the computer after a certain time so homework gets done or they go to bed? Program your smart hub or software so the Smart Switch 6 turns off video games or computers when they shouldn't be used. The switch is micro-sized at 60 x 60mm so that it fits side by side in a receptacle or power bar without hogging space. Smart Switch 6 has power metering built in and can change the colour of its ring to show energy consumption or monitor it with a compatible smart hub or software. The colour ring built into the ZW110 indicates on/off status and amount of current used by changing colour or it can be turned off. 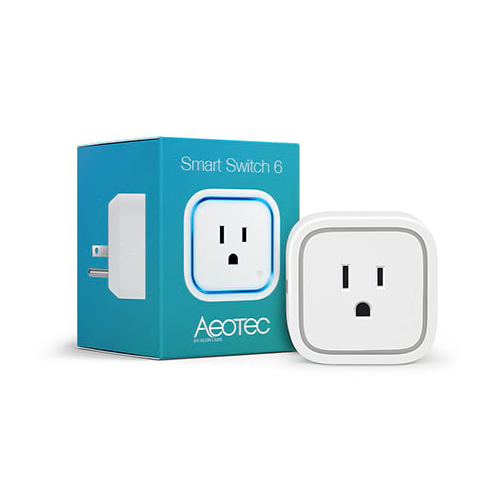 The tiny size of the smart switch 6 means it can be used side by side in an outlet or power bar. Note: This model does not have a USB port.